St. Patrick was born in Roman Britain at Banna Venta Berniae, – a location otherwise unknown, though identified in one tradition as Glannoventa, modern Ravenglass in Cumbria – to wealthy parents near the end of the fourth century (400 A.D). Calpornius, his father, was a deacon, his grandfather Potitus, was a priest. When Patrick was sixteen years old, he was captured as a slave by the high king of Ireland. He was sold in Ireland and was taken to the North east of the country to herd sheep. Patrick worked as a herdsman, remaining a captive for six years. During the six years of solitude, he found a life of prayer and pledged his life to God. He writes that his faith grew in captivity, and that he prayed daily. After six years he heard a voice telling him that he would soon go home, and that his ship was ready. Fleeing his master, he travelled to a port two hundred miles away, where he found a ship and returned home to his family, now in his early twenties. Patrick studied religion for many years to become a priest and a missionary and at night he would hear in his dreams the call from the Irish. They called him to come and free them from paganism, “crying to thee, come hither and walk with us once more”. Finally Pope Celestine fulfilled Saint Patrick’s wish and ordained him as bishop to preach the word of God to the Celtic People. Saint Patrick then came back to Ireland to help teach the word of God. He helped to build churches and he baptised the pagans into Christianity, he also ordained bishops and priests but this did not come without difficulty. The Annals of Ulster state that he arrived in Ireland in 432, ministered in Ulster around 443, and died in 457 or 461. The actual dates of Patrick’s life cannot be fixed with certainty but, on a widespread interpretation, he was active as a missionary in Ireland during the second half of the 5th century. He is generally credited with being the first bishop of Armagh, Primate of All Ireland. According to the latest reconstruction of the old Irish annals, Patrick died in AD 460 on March 17, a date accepted by some modern historians. Most historians now assert that Patrick was indeed most likely to have been active in the latter half of the fifth century. St. Patrick is depicted with shamrock in the stained glass window in St. Benin’s Church, Kilbennan, County Galway. Irish Legend (dating to 1726) credits St. Patrick with teaching the Irish about the doctrine of the Holy Trinity by showing people the shamrock, a three-leafed plant, using it to illustrate the Christian teaching of three persons in one God. For this reason, shamrocks are a central symbol for St Patrick’s Day. The shamrock had been seen as sacred in the pre-Christian days in Ireland. Due to its green color and overall shape, many viewed it as representing rebirth and eternal life. Three was a sacred number in the pagan religion and there were a number of “Triple Goddesses” in ancient Ireland, including Brigid, Ã‰riu, and the Morrigan. March 17, popularly known as St. Patrick’s Day, is believed to be his death date and is the date celebrated as his feast day. The day became a feast day in the universal church due to the influence of the Waterford-born Franciscan scholar Luke Wadding, as a member of the commission for the reform of the Breviary in the early part of the 17th century. St Patrick had come to be revered as the patron saint of Ireland by the 7th Century. 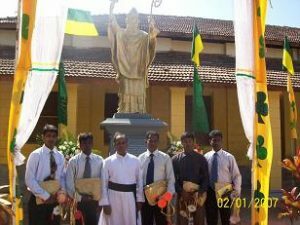 It is known that many of the missionaries associated with the initial naming and establishment of St Patrick’s College, Jaffna, – Bro. Patrick Conway, Fr. Patrick O Flanagan to name a couple – were Irish. 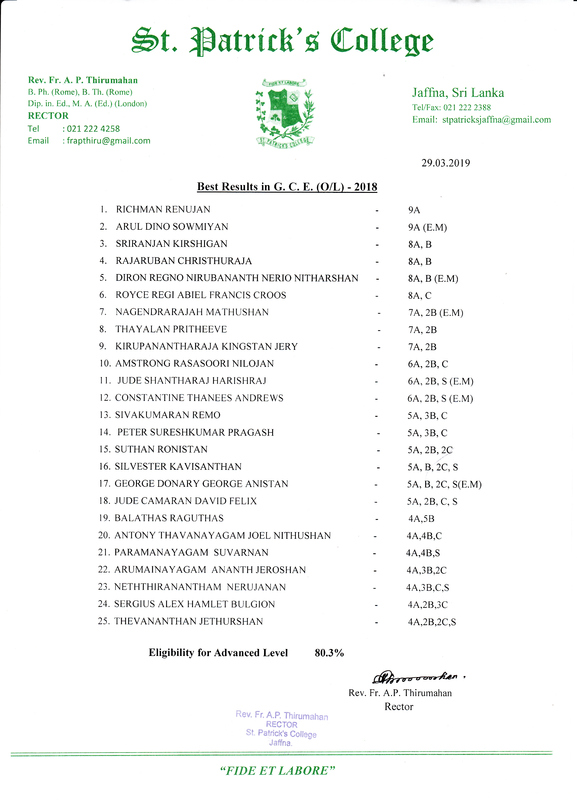 Bishop Bonjean decided in 1880 to amalgamate the preparatory ecclesiastical seminary and the Jaffna Boy’s seminary under the title of St. Patrick’s College. 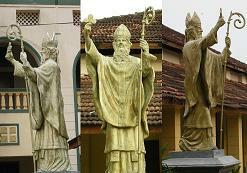 An eight feet long statue of St. Patrick was blessed and unveiled by the Bishop of Jaffna, Rt. Rev. Dr. Thomas Savundranayagam (His Lordhsip is a Patrician, himself) on 5th April 2010. This was placed outside the College chapel facing the main entrance. 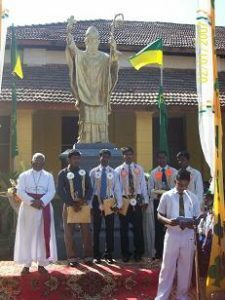 Five Patricians after graduating in Art & Design from the University of Jaffna sculpted and presented this Statue to the College.